Grind all the above mentioned ingredients in a masala grinder/blender to a fine thick paste using very little water. Transfer this paste to a bowl. Heat a tempering pan or a small pan with oil until hot. Reduce heat & gently slide in the above mentioned ingredients. Let it pop & crackle. Saute for a minute. Pour this hot tempering on to the above prepared chutney paste. 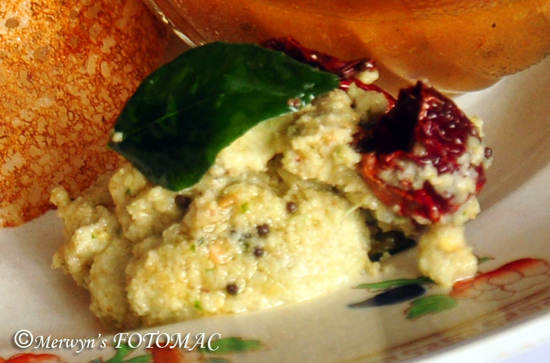 Serve the coconut chutney with dosas, uttappas, idlis or vadas etc.